This decal sheet comes in 1/72 scale. 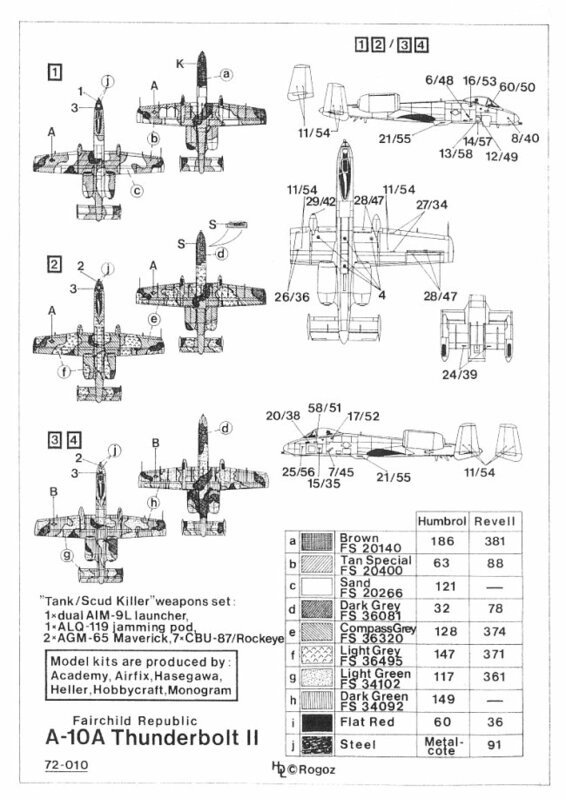 The decal sheet includes stencils for one of four A-10's, plus markings for the 4 different A-10's. 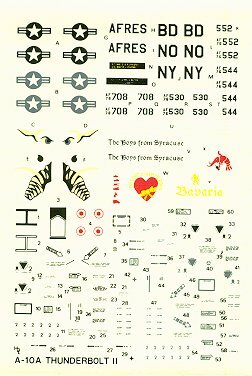 This decal sheet covers the A-10 Warthog from the Desert Storm period as well as one plane from "The Boys from Syracuse" New York ANG in 1982 . 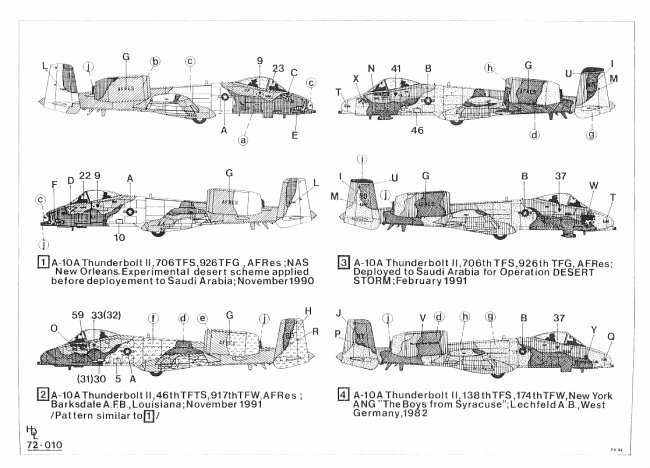 The painting options include everything from a 3 tone Brown/Tan/Sand Experimental Desert Scheme from Desert Storm on this sheet to a 3 Tone grey paint scheme to the Grey/Dark Green/Light Green A-10 paint scheme. Three of the planes include nose art. The quality of the sheet is good....excellent colours.....clear printing and completely in register although the stencil data for the 1/72 stencils are too small to be clearly printed and readable. I recommend this sheet to anyone looking for interesting options to the kit decals. Recommended kits are the 1/72 Academy, Airfix, Hasegawa, Heller, Hobbycraft or the Monogram kit. Decal option #1 is an A-10 Thunderbolt II of the 706 TFS, 926 TFG, AFRes; out of NAS New Orleans. This plane has an experimental desert paint scheme that was applied before deployment to Saudi Arabia in November 1990. The paint scheme is Brown (FS 20140), Tan Special (FS 20400) and Sand (FS 20266). Markings also include a Warthog Wild Pig mouth and eyes.  Decal option #2 is an A-10 Thunderbolt II of the 46 TFTS, 917th TFW, AFRes; out of Barksdale AFB, Louisana in November 1991. The paint scheme is Dark Grey (FS 36081), Compass Grey (FS 36320) and Light Grey (FS 36495). Decal option #3 is an A-10 Thunderbolt II of the 706th TFS, 926th TFG, AFRes; Deployed to Saudi Arabia in February 1991for Operation Desert Storm. The paint scheme is Dark Grey (FS 36081), Light Green (FS 34102) and Dark Green (FS 34092). Markings also include nose art with a red heart on one side of the nose and a red Crawfish on the other side. Decal option #4is an A-10 Thunderbolt II of the 138th TFS, 174th TFW, New York ANG "The Boys from Syracuse" out of Lechfeld AB in West Germany in 1982. The paint scheme is Dark Grey (FS 36081), Light Green (FS 34102) and Dark Green (FS 34092). Markings also include text reading "The Boys from Syracuse" on both engines and nose art with the word Bavaria in yellow on one side of the nose.